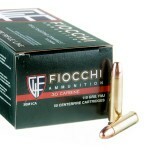 Winchester developed 30 carbine ammo for the US military in the late 1930s. 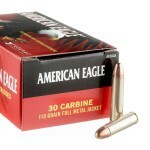 The cartridge was designed before the M1 Carbine that was eventually made to fire it. 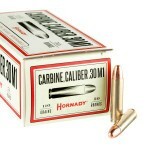 It is a relatively light-shooting cartridge designed to be more effective than .45 ACP ammo at medium range while still fitting in a compact weapon lighter than the M1 Garand or M1903 Springfield. 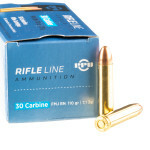 Although its reputation suffered somewhat when pressed into front-line infantry roles for which it was not intended, the .30 Carbine ammunition remains in use today due to its ease of handling and the wide availability of M1 Carbines as surplus during the latter half of the 20th century. 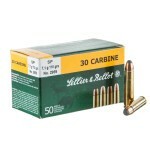 In recent years, some manufacturers have also begin producing replicas that fire the historically correct .30 Carbine ammo. 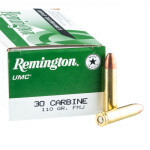 The almost universal load for the .30 Carbine is a 110 grain projectile with a muzzle velocity of about 2,000 feet per second. 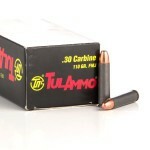 This results in ballistics comparable to magnum pistol rounds and good medium range performance when fired from an M1 Carbine or other long gun. 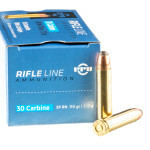 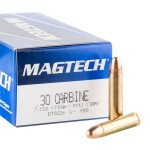 While most .30 Carbine ammo is intended for the range and fires FMJ (full metal jacket) projectiles, soft point ammo for hunting small game is available from Prvi Partizan, Magtech, Sellier & Bellot, Remington, and Federal. 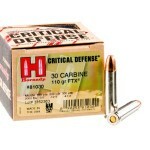 For those looking to turn their carbine into a home defense weapon (a use for which it is arguably quite suitable), Hornady offers an entry in its Critical Defense series firing FTX jacketed hollow point bullets that deliver strong expansion. 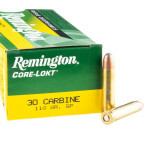 While originally employed as a light rifle cartridge, the .30 Carbine has been adapted to a variety of handguns including the Ruger Blackhawk, AMT Automag, and Taurus Raging Thirty.